Coral reefs are found in shallow waters throughout the tropics. Although corals contribute the largest amount to reef-building (up to 10 kg CaCO3 m2 yr1) many other organisms that secrete limestone-like forms of calcium carbonate such as coralline algae, molluscs, bryozoans, and the green alga Halimeda also play a part. Simultaneously, other plants and animals such as chitons, clionid sponges, clams and parrotfish will be destroying the reef through bioerosion at rates that can equal those of production. The reef structure is thus the net result of construction and removal, so that not everywhere that corals grow do significant reefal structures develop. However, corals remain the most important contributors to reef growth and have some strict environmental requirements, many of which are related to the symbiotic zooxanthellae that require light for photosynthesis. Thus, corals in turbid waters may be limited to a depth of only 8 m but in the clear waters of the outer shelf of the GBR on Myrmidon Reef off Townsville living corals have been observed to depths of 100 m and Halimeda to 125 m.
Temperature is also important. The optimum temperature is about 26-27°C with an absolute range of 18-36°C; extremes being tolerable for short periods, for example, at low tide in reef flat pools. Individual corals appear to adapt to their ambient environmental conditions, generally also through the tolerance of their zoox-anthellae. Temperature excursions, either higher or lower from the normal range, even if withstood by the same species elsewhere, may locally result in expulsion of the zooxanthellae, coral bleaching and possible mortality. Salinity affects most reef builders and optimal conditions of about 36 %o or about the level of the open ocean are ideal, with the accepted range being between 30%o and 40%o. Lower salinity produced by heavy rainfall or runoff can only be tolerated for short periods and is generally the reason for the lack of reefs close to the mouths of major rivers. As the freshwater floats on the salt water, lowering of the low salinity surface water onto a reef flat at low tide can be devastating. Turbidity is also regarded as a major controlling factor on reef growth. Muddy substrata are unsuitable for larval settlement and reefs are not found where fine sediments have accumulated over time. Turbidity, the result of suspension of sediment in the water column, is more transient and surprisingly high levels may be tolerated. The study of fringing reefs at Cape Tribulation and Magnetic Island have shown that much of the turbidity is caused by resuspension of sediments during rough weather and, as long as the sediment does not settle on the reef and is kept moving by wave action, turbidity levels of more than 100 mg L 1 can be withstood. Further, corals from inshore environments are far more tolerant of high suspended sediment levels than exactly the same species on mid and outer shelves. Great diversity can be maintained on these reefs, for example, 141 species from 50 genera of hard corals have been recorded from the Cape Tribulation reefs. Thus, although the total amount of sediment input to GBR waters has increased by more than three times in the last 150 years this is insignificant compared to the billions of tonnes delivered to the nearshore zone and resuspended by wave and current activity over the last 6000 years. Only where new sediment is reaching existing reefs does it have detrimental effects. For example, the fringing reef on High Island, south of Cairns, extends down to 20 m depth and new sediment settling on the lower part of this reef is causing damage as it is below the level of wave action and cannot be resus-pended. Increased nutrients may also be associated with increased sediment yield, further adding to reef decline. • The windward coral-covered reef front is generally steeper in the high energy areas such as the ribbon reefs. Near the top of the reef front may be a distinctive 'spur and groove' zone of coral covered buttresses and intervening channels within which sediment may move. • The reef crest commences with a living coral zone just below the low tide level. Then follows an intertidal algal pavement, the exact composition of which varies but on the GBR is rarely similar to the prominent coralline algal ridge of mid oceanic atolls. Coralline algae are present, but this zone is dominated by turf algae, which hold together sediment such as coral shingle. On this surface there may be large reef blocks up to 4 m in diameter, torn from the reef front in cyclones or by tsunamis. • The highest part of the reef is a rubble zone of coral shingle and larger fragments, forming a shingle rampart. It is formed of material from the reef front and deposited by waves as they lose energy passing over the reef flat. • The aligned coral zone forms the rearmost part of the reef flat, with coral colonies growing in lines perpendicular to the reef front and separated by narrow sandy channels. • The sheltered back-reef area, often in the form of a sand slope, contains the most fragile branching colonies. Within this zonation are distinctive changes to coral colonial morphology (Fig. 2.1). Light, wave energy, and emersion are the major controls on both ecomorphol-ogy and diversity. At greatest depth on the reef front, light is the most limiting control and corals may adopt a globose or plate-like shape. Higher up, in the optimal photic zone, but below wave base, colonies can be intricately branching, but moving up into the wave zone stronger colonial structures dominate with encrusting forms on the reef crest. On the reef flat a variety of forms may be found, with exposure the limiting factor. The upper limit to coral growth is about low tide level but varies with species and with local environmental conditions related, for example, to wave action. However, in some instances the low tide level may be controlled by moating behind shingle ramparts or algal ridges and under these conditions, the same level is achieved on every low tide. Corals respond by growing to these levels and form distinctive microatolls: flat discs usually circular and up to half a metre thick. Both head and branching corals form microatolls, though the majority are head corals, the most common being Porites sp. They can be up to 10 m in diameter, and, as their upper surface is determined by the moated low tide level, any change in this level, for example as the result of a cyclone lowering a shingle rampart, will produce a change to the surface morphology. Annual growth rings can determine the age of these environmental modifications. 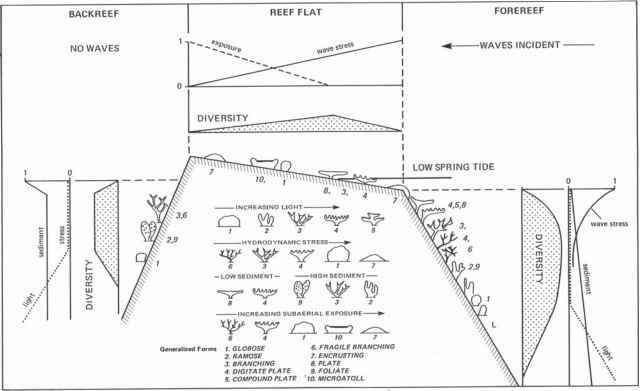 Figure 2.1 Geomorphological and ecomorphological zonation on a reef in response to light, sediment and wave stress, and subaerial exposure (after Chappell 1980). Reprinted by permission from Macmillan Publishers Ltd from: Chappell, J. (1980: 250). Light may become a factor in determining the morphology in nearshore turbid environments. In turbid waters the whole ecomorphological zonation may be vertically compressed and colonial morphology that encourages sediment shedding dominates. The GBR (Fig. 2.2) is the largest marine province in the world and has great geomorphological diversity, lacking only open ocean atolls. From 9°15'S the GBR extends southwards off the coast of Queensland to Lady Elliott Island at 24°07'S, a latitudinal spread of 14°52'. The outer perimeter of the reef province is about 2300 km. The outer reefs vary greatly in distance from the mainland coast, approaching within 23 km at 14°S to a maximum of 260 km at 21°S. On the wider shelf, reefs are established on the outer third with a wide area of reefless sea floor at depths of between 20 m and 40 m but with a very gentle slope. In the north, reefs occupy a much greater proportion of the shelf but a narrow reefless 'shipping channel' can still be recognised. The outer edge of the GBR lies on the shoulder of the continental shelf in water depths of up to 100 m, beyond which the sea floor falls away almost vertically in the north, more gently in the central and southernmost GBR (Bunker-Capricorn Group) and in a step-like fashion off the southern-central GBR in the vicinity of the Pompey Reefs. Figure 2.2 The Great Barrier Reef - locations. count separate reefs in complex parts of the GBR and to fully recognise submerged shoals, a figure of 2900 reefs is generally accepted for the Marine Park. For Torres Strait there is an additional 37 000 km2 of shelf area and a further 750 reefs covering an area of about 6000 km2. The early establishment of the GBR is discussed in Chapter 3 where the importance of Pleistocene sea level changes is indicated. The last time sea level was at or above its present level was about 125 000 years ago at which time the GBR was at least as extensive as it is today. Subsequently, a series of interstadial high sea levels between 60 000 and 70 000 yrs BP(Before Present) and only 15 m to 25 m below present level were capable of adding further growth to the reefs of the outer shelf. Sea level reached its lowest point of at least -125 m around 20 000 years ago. 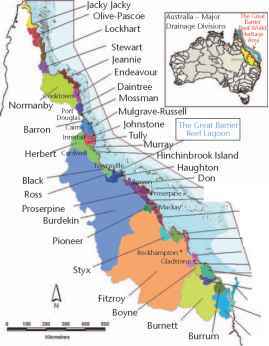 At this time the whole of the GBR, including the shoulder of the continental shelf, was exposed and rivers such as the Burdekin flowed across it to the shelf edge. The modern GBR developed as the postglacial marine transgression flooded the continental shelf. This took place about 10 000 years ago although the first flooding may not have favoured coral growth as Pleistocene soils and regolith were reworked, producing turbid, eutrophic conditions especially in the lee of the ribbon reefs where extensive meadows of Halimeda were the first carbonate structures to develop. The Halimeda bioherms, or mounds, up to 18.5 m thick are found inside the ribbon reefs from Cooktown to Torres Strait. They have been maintained to the present day by the jetting of deep nutrient rich water through the passes that exist between the ribbon reefs. By 9000 years ago sea level was about -20 m below the present position and the older Pleistocene reefs were being inundated. The oldest radiocarbon ages from the Holocene reefs are just over 9000 years and, once inundated, recolonisation and vertical accretion was rapid. The bulk of the Holocene reef was laid down between 8500 and 5500 yrs BP at rates of up to 13 m ka 1 (mean about 6 m ka1). Effectively the transgression was complete by 6500 yrs BP, but shelf warping as the result of hydro-isostasy (depression of the outer shelf and compensatory upwarping of the inner shelf due to weight of the water) produced some cross shelf contrasts. Thus, whilst modern sea level had been achieved by 6500 yrs BP on the inner shelf (documented by raised reefs of up to 1.5 m on inner fringing reefs and the inner shelf low wooded island reefs of the northern GBR), the age becomes progressively younger towards the outer shelf where no emergence took place. There is also evidence of tectonic shelf-warping in the central GBR where the Halifax Basin of the Coral Sea impinges upon the shelf. Down-warping is suggested by the extensive line of submerged reefs on the outer shelf south of Cairns. There are also regional patterns in the depths down to the Pleistocene foundations of the modern reefs. Although some variation may be expected due to original morphology or subsequent erosion, the pattern as shown by reef drilling also supports the down-warping on the outer half of the continental shelf. In Torres Strait and the far northern region south to Cook-town there is a gradual increase in minimal depth from -5 m in the north to between —15 m and —17 m in the south. South of Cairns the depth to the Pleistocene foundation increases by more than —5 m and everywhere, except Britomart Reef (where it is at -19.8 m), is at depths greater than 20 m. On a cross shelf transect just south of Mackay the variation is from 0 m at Digby Island, between —8.0 m and —13 m on mid-shelf reefs and —17.5 m beneath Cockatoo Reef in the Pompey Complex. 9000 yrs BP and accumulated much of their structure by 5500 yrs BP. (i) Rocky foreshore - formed as sea level rose against the rocky slopes of offshore islands, especially on the windward side. These reefs are generally narrow and not as common as might be expected. (ii) Pleistocene reefal substratum - unlike mid and outer shelf reefs, older Pleistocene fringing reef foundations are not common. The large fringing reef of Hayman Island is the best example. At Digby Island, Pleistocene reef is exposed at the surface. (iii) Preexisting positive sedimentary structures such as alluvial fans (Magnetic and Great Palm Is), transgressionary sedimentary accumulations (Pioneer Bay, Orpheus Island), leeside island sandspits (Rattlesnake Island), deltaic gravels (Myall Reef, Cape Tribulation) and boulder spits (Iris Point, Orpheus Island). Various modes of reef growth have been recognised, including the growth of offshore structure and subsequent backfilling to form the reef flat (e.g. Hayman Island and Yam Island in Torres Strait) or the development of a nearshore reef subsequently attached to the mainland by shoreline progradation. However, the most common form is progradation, usually episodically, due to sea level fall or other environmental factors, from shoreline outwards to reef front. (iii) irregular reef patches, formed when coral growth first reaches sea level. (ii) lagoonal reefs that form as the outer reef flat extends around the margins enclosing a lagoon that is slowly infilled by patch reef growth and by transport of sediment from the windward margins into the lagoon. (iii) planar reefs, with the lagoon infilled and reef flat extending across the entire reef. Sediment and sea-grass beds or mangroves may dominate the reef flat and coral cays are common on such reefs, including low wooded islands. Two dominant factors determine the stage a mid-shelf reef has reached. The first is the depth to the Pleistocene antecedent reef (that influences the depth of lagoon to be infilled), with reefs growing from shallow foundations most quickly reaching modern sea level and progressing to a mature or senile stage. The second is the size of the reef, as this determines the ratio of highly productive perimeter to the volume of lagoon to be infilled. Larger reefs, once they reach sea level, progress much more slowly. It was shown earlier that the depth of Pleistocene foundations on the GBR was not random, with shallow depths in the north and far south, a cross shelf gradient in the southern-central GBR, and generally depths greater than 20 m on the central GBR shelf. Reef types reflect this variation with submerged reefs, patches and crescentic reefs dominating the central GBR and most planar reefs found north of Cairns or south of Mackay. Most reefs on the shoulder of the continental shelf (with the exception of the detached reefs in the north) are linear, parallel to the shelf edge and have originated as fringing reefs at earlier low sea levels, though they are certainly multicyclic. Morphology of the shelf edge and tidal range are the greatest influences on reef type. Northern detached reefs. These reefs appear to grow on isolated pinnacles of fragmented continental crust. Ribbon-like reefs occur on the windward side of some, with large Halimeda meadows to the lee. On Raine Island, the top of the Pleistocene is 11 m below reef flat level, with the reef flat developing about 6000 years ago, and the cay (a significant turtle nesting site) initially accumulating about 4500 years ago. 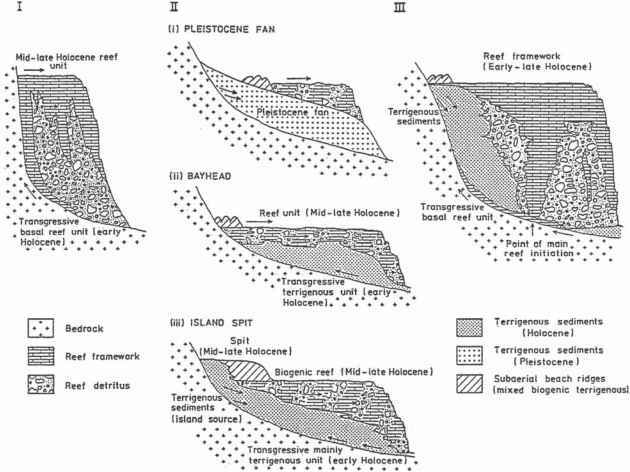 Figure 2.4 An evolutionary classification for mid-shelf reefs growing from Pleistocene reefal foundations (from Hopley, 1982). Northern deltaic reefs. 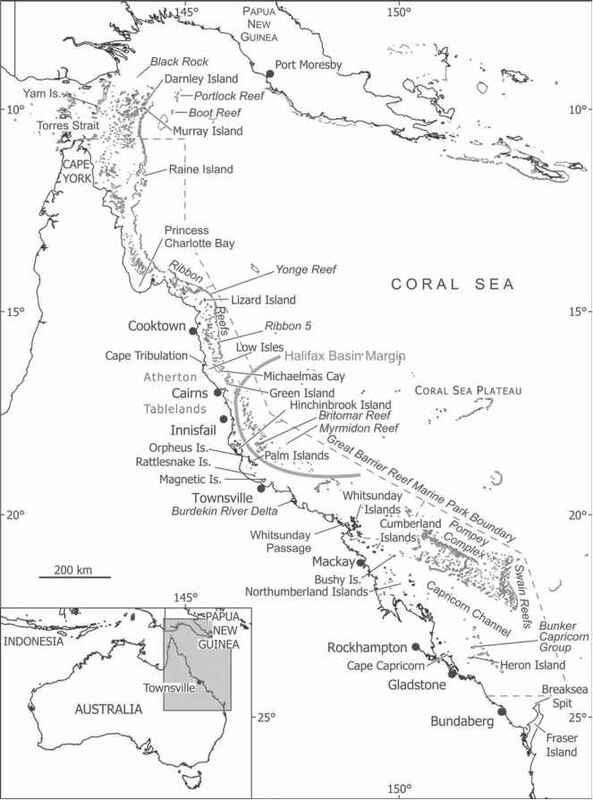 The northernmost 96 km of shelf edge of the GBR south of the Gulf of Papua consists of short (up to 4 km) narrow reefs parallel to the shelf edge, separated by passages up to 200 m wide. Water depths at the shelf edge are only 30 m to 40 m but on the ocean side is a steep drop-off down to >700 m. Complex delta-like lobes have formed on the inner western side of each passage, deposited as sedimentary structures in response to strong flood tide currents. These have formed the foundation for reef growth. Ribbon reefs (Fig. 2.5E). These form a classic shelf edge barrier reef system between 11°S and 17°S (about 700 km). Individual reefs are up to 28 km long, separated by narrow passages most of which are less than 1 km wide. Currents through the passes are weaker than opposite Torres Strait and although the ends of the reefs curve inwards there are no deltaic structures. However, tidal jets carrying nutrient rich water from the front of the reefs (that have a steep drop-off down to >1000 m) surge through the channels and maintain the extensive Halimeda bioherms described above. The outside of Ribbon 5 has been explored by submersible and shows dead reefs at —50 m and —70 m above an almost vertical limestone cliff down to 200 m. The Pleistocene is at —15 m on Ribbon 5 and —19 m on Yonge Reef. Holocene growth commenced about 8000 years ago and the ribbon reefs appear to have reached modern sea level between 6000 and 5000 yrs BP. Because of the high energy conditions, the ribbon reefs display a strong zonation. GBR is the presence of up to three lines of submerged reefs rising from water depths down to —100 m. In places these reefs may be as much as 70 m deep but elsewhere approach the surface though many remain unmapped. These features are composite, formed during many transgressive and regressive episodes. Many appear to be dead, perhaps drowned by rapid sea level rise, sediment shedding from upslope or decline in water quality when the shelf margin was first drowned. However, some dense stands of coral have been seen on ROV dives. This area of the shelf has experienced hydro-isostatic subsidence but the impingement of the active Halifax Basin onto the shelf may be the most important influence on the distribution of the submerged reefs. The Pompey Complex. The unique reefs of the Pompey Complex extend over a shelf distance of 140 km and include some of the largest reefs of the GBR, many between 50 km2 and 100 km2. The entire reef tract, which parallels the shelf edge, is between 10 and 15 km wide. However, the reefs themselves are not on the shelf edge, which lies a further 20 km seaward, separated from the Pompey Reefs by a series of probably fault controlled steps, most prominently at —70 m and —80 m, the edges of which are the location of further submerged reefs some of which come to within 10 m of the surface. Narrow channels cut through the Pompey Reefs reaching depths of over 100 m, up to 40 m deeper than the shelf on either side. These reefs are on the outer edge of the widest part of the GBR shelf, in the area of highest tidal range that reaches 10 m on the mainland and exceeds 4 m within the reefs. Tidal currents greater than 4 m s 1 have been recorded and are responsible for both the scouring of the channels and the deltaic reefs at both ends of them. Unlike the northern deltaic reefs, water depths have been sufficiently shallow for ebb tide deltas to develop on the seaward side of the reefs as well as the western side, producing extremely complex morphology. Intricate lagoons, with blue hole sinkholes (to 90 m deep) formed at low sea levels also typify the Pompey Reefs. of the Pompeys. A steep drop-off occurs around the northern margin, but to the south and west adjacent to the Capricorn Channel the slope is far gentler. The Bunker-Capricorn Group. The southernmost reefs of the GBR are set back from the shelf margin, which is poorly defined. The reefs grow over shallow Pleistocene foundations and are either planar or la-goonal with many cays. Corals are not found in the shelf sediments south of 24°S and it is possible that there was no reef growth at this latitude at the height of the glacial periods. Wave action accumulates sediments produced by coral reefs in particular areas of the reef flat to form various types of coral islands or cays. Reef flat is required and as some can be up to 6000 years old, reef islands are all younger than this. As reefs of the central GBR are relatively immature, no vegetated reef island exists between Green Island (16°45'S) and Bushy Island (25°57'S). Centripetal action of refracted waves moves sediment over the reef, deposition occurring when the waves no longer have the capacity to carry it further. Capacity to carry shingle is quickly lost in normal weather conditions and shingle cays and ramparts are found on the windward side of reefs. Sand may be carried greater distances and sand cays are usually found towards the lee of the reef, the shape depending on the wave refraction pattern. On oval reefs the depositional area may be fairly compact and the cay is oval. On elongate reefs the depositional area where wave trains from each side of the reef meet is linear and the resulting island is longer and narrower, such a shape being susceptible to changing location and erosion in response to changes in weather patterns. On stable, older cays, mature soils, perhaps with guano deposits, have had time to form and a climax woodland vegetation, for example, Pisonia grandis, may exist but because of constant changes all stages of the vegetational succession may be present on a single island. Classification and description of reef islands is based on sediment type (sand or shingle) and vegetation cover (from unvegetated to highly complex including reef flat mangroves). Island shape and size are also important as there is a threshold island width of about 120 m to support a freshwater lens on which mature vegetation depends. Some reefs have more than one island, a windward shingle cay and a leeward sand cay but the most complex are the low wooded islands of the northern Reef. These consist of windward shingle ridges and cemented ramparts that give protection to the reef flat over which mangroves can become established (in some instances over almost the entire reef top). Sand cays are usually found on the leeside of these reefs. There is a distinctive pattern in the distribution of island types. Unvegetated islands occur throughout the GBR but are least common on the central GBR, where vegetated cays are totally absent. Vegetated cays are most numerous in the far south and far north and occur on six of the Swain Reefs. Low wooded islands are limited to the inner shelf north of Cairns. Within the GBRMP are 213 unvegetated cays, 43 vegetated cays and 44 low wooded islands (total 300) though changes are continually taking place, especially to those with ephemeral vegetation. The GBR has changed dramatically over the last 10 000 years and, in terms of coral cover and ecological variety, was probably at its peak about 6000 years ago. Since then reefs have progressed towards more senile stages. Global climate change may accelerate this trend. Even a simple rise in sea level may see a renewal of carbonate productivity over reef flats that have been at sea level for 5000 years or more, but with more efficient movement of sediment as water levels deepen. However, increases in coral mortality from bleaching, diseases, and fragility of many surviving corals as oceans become more acidic are all going to accelerate sediment production and infilling of lagoons. 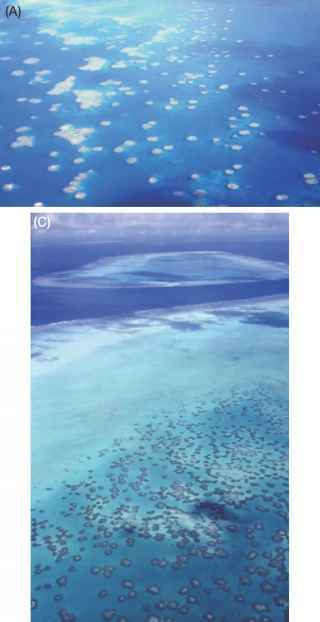 These same processes may counteract the rise of sea level against reef islands. Geomorphological studies show that far from disappearing as some have suggested, islands may increase in size. Tropical cyclones, which may increase in frequency and magnitude, can both erode and build island structures largely dependant on tidal conditions. All these changes will tend to remove and rework the oldest part of the islands containing mature soils and vegetation returning them to an early stage of their vegetational succession. Changing climate will have major effects on geomorphological processes that in turn will impact on the ecology of the GBR. Chappell, J. (1980: 250). Coral morphology diversity and reef growth. Nature 286: 249-252. Partian, B. R., and Hopley, D. (1989: 39). 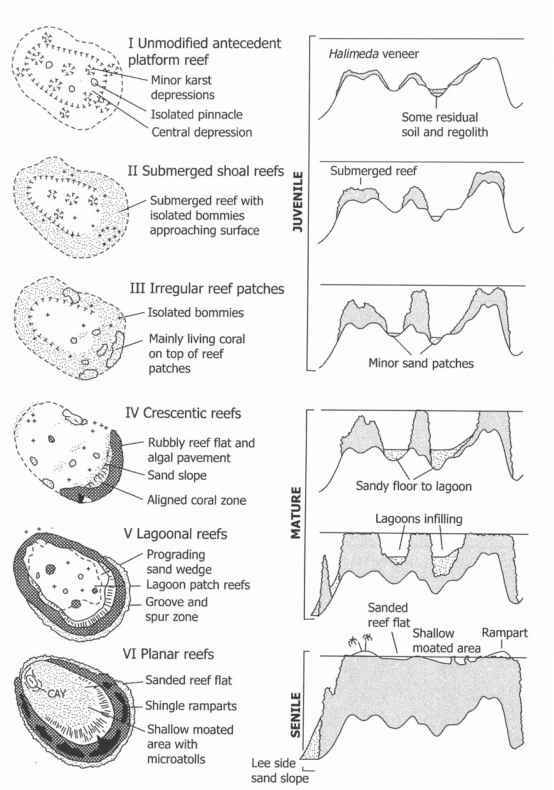 Morphology and development of the Cape Tribulation fringing reefs, Great Barrier Reef, Australia. Technical Memoir No. 21, Great Barrier Reef Marine Park Authority, Townsville.